andwiched on a narrow sandbar between Yarmouth’s harbor and the open Gulf of Maine, the fishermen of Yarmouth Bar have long struggled to keep the sea at bay. In accordance with climate change models, the region has also been experiencing markedly increased rainfall and snowfall, reducing the salinity of the gulf and hampering the growth of the microscopic marine plants at the base of the food web. More frequent extreme precipitation events are making coastal waters more acidic, snuffing out baby oysters, mussels and other creatures that have difficulty building their shells under the new conditions. 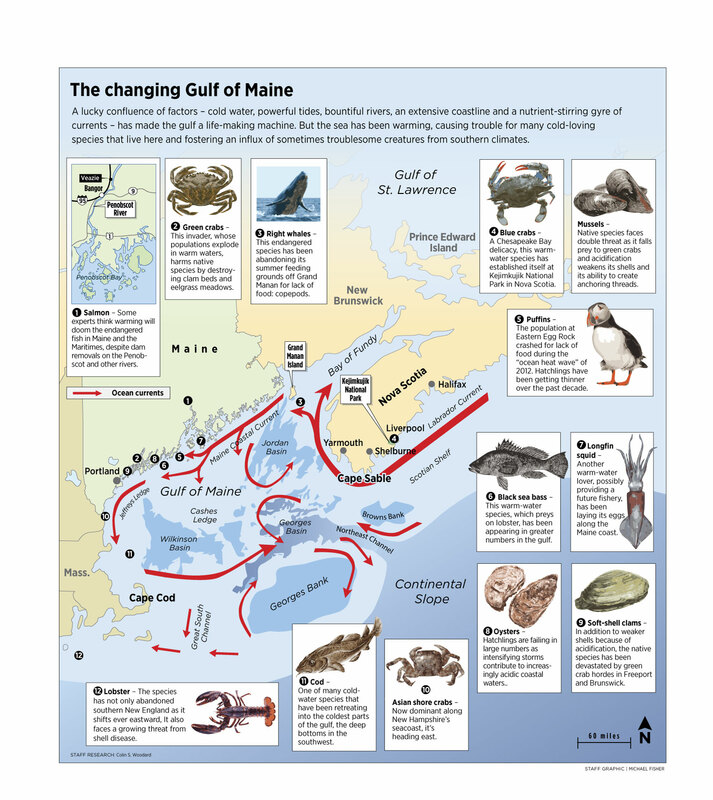 ew places in the world’s oceans are as well-suited to sustaining marine life as the Gulf of Maine. By a fortunate confluence of geography, geology, climate and oceanography, the gulf is a fertile oasis in an ocean that is, ecologically speaking, largely desert. On a standard map, the gulf looks like little more than a bulge of the Atlantic Ocean, but on a nautical chart its true nature is revealed. Hidden just a few dozen feet beneath the waves at its southern entrance are two enormous submerged islands – Georges and Browns banks – which separate it from the surrounding ocean, deflecting and shaping ocean currents. It’s really a semi-enclosed sea, like the Baltic or Mediterranean seas, with characteristics all its own. 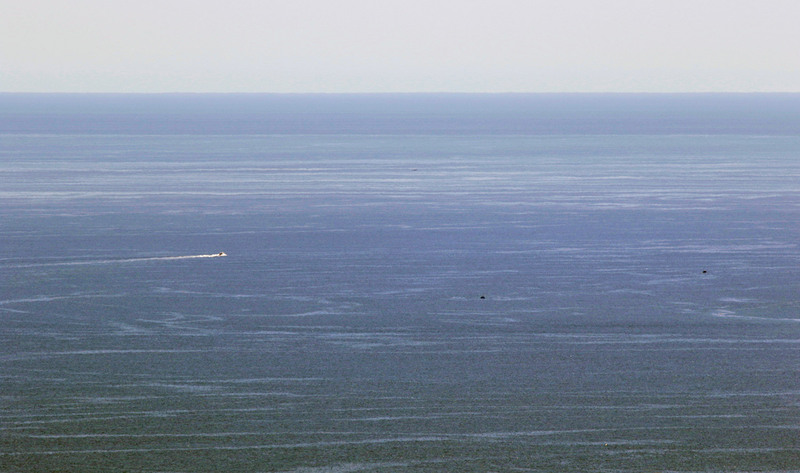 Two narrow channels provide the only deep-water connections into the gulf. The larger of these, the Northeast Channel is only 22 miles wide, but through it often flows a cold, nutrient-rich current originating among the ice floes of northern Labrador. It courses around the end of Nova Scotia and loops the mouth of the Bay of Fundy before flowing down the coast of Maine like an ecological conveyor belt, then arcing back around the northern flank of Georges Bank to form a spinning, life-sustaining gyre. In the oceans, as on land, plants are at the base of the food web, capturing and storing the sun’s energy through photosynthesis. At sea, most plants are microscopic, and they generally thrive when two things can be found at once: light, which is available only near the surface, and nutrients, which tend to fall to the dark ocean floor. The Gulf of Maine puts these things together in myriad ways. First there are the river systems – the Kennebec, Penobscot, Saint Croix, Saint John and 21 others – that together drain a quarter-trillion gallons of fresh, nutrient-laden water into the gulf each year, further fertilizing the sea. The cold climate plays a role, helping to prevent nutrient-rich bottom water from being trapped under a thick layer of warmer, lighter surface water, as happens in warmer climates. Then there are the tides – the world’s highest, thanks to the fortuitous interaction of coastal geography and the orbital tracks of the Earth and moon around the sun – rising and falling 50 feet and more at the head of the gulf, the Minas Basin in Nova Scotia, and then surging in and out of the Bay of Fundy where it collides with the north-south tides flowing in and out of the bays and estuaries of Maine. The tides mix and churn the water, keeping nutrients suspended in the lighted surface waters and even forming the Western Hemisphere’s largest whirlpool, the Old Sow off Eastport at the Maine-New Brunswick border. 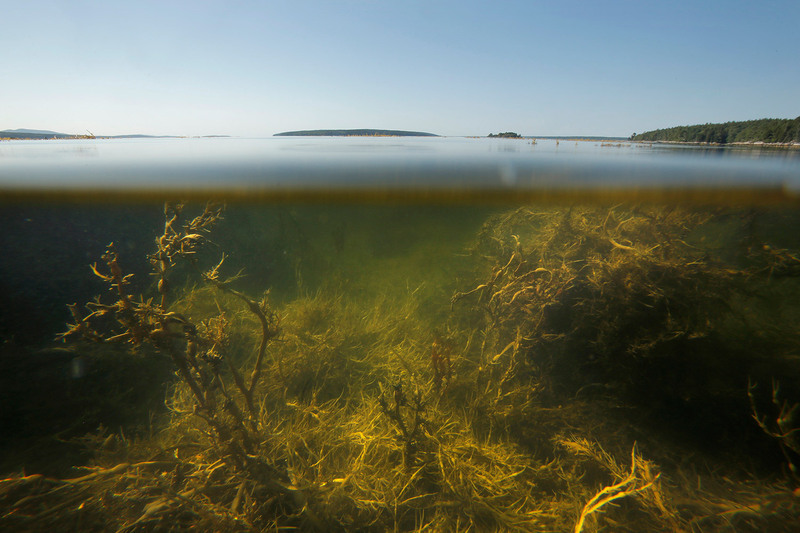 They also create vast expanses of critical habitat: the salt marshes, clam flats, mussel banks and seagrass meadows that serve as nurseries for countless marine creatures. 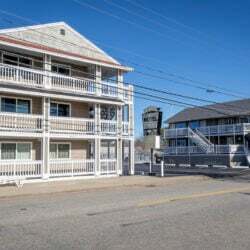 The tides and currents flow across a ragged coast, especially between Cape Elizabeth and Saint John, New Brunswick, where deep bays and estuaries reach 5, 10 or 20 miles inland between long peninsulas and thousands of islands dot the coast. The gulf is only 400 miles across from the elbow of Cape Cod to the Minas Basin, but if the coast were stretched into a straight line it would run for 7,500 miles – 3,000 more if the island shores were added. All that coastline makes for an incredible abundance of prime ocean habitat, with large quantities of rocky, complex seafloor located near enough to the surface to be bathed in life-sustaining light. 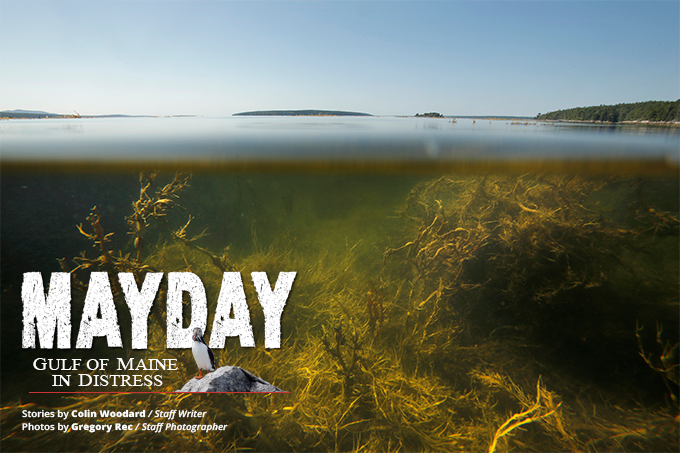 n its pristine state, the Gulf of Maine was stupendously productive. Early European explorers were flabbergasted by its largesse. They encountered great schools of whales, landed 5-foot-long cod with virtually every drop of a hand-held hook, and waded at low tide to capture 20-pound lobsters among the rocks. 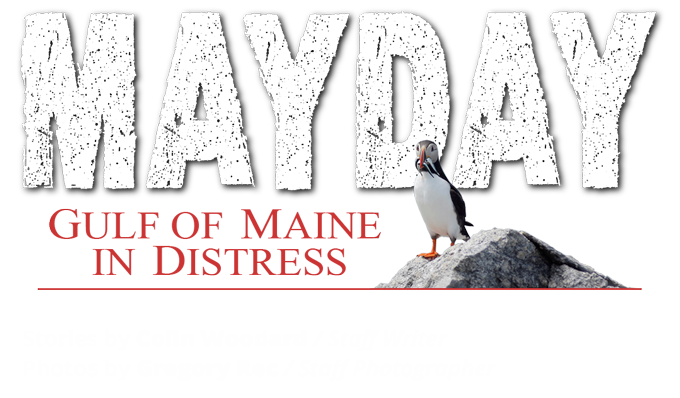 It was in the pursuit of cod that Maine was first colonized, starting with year-round fishing stations at Damariscove, Monhegan and other islands in the decade prior to the Pilgrims’ landing at Plymouth. The Pilgrims avoided starvation at the end of the winter of 1621-1622 only by turning to Damariscove for food, and the later Puritan experiment at Massachusetts Bay was underwritten by its own fishing stations, leading 18th-century New England leaders to put the image of the cod on their stamps, coins and buildings. “The members of the ‘codfish aristocracy,’ those who traced their family fortunes to the 17th-century cod fisheries, had openly worshiped the fish as the symbol of their wealth,” Mark Kurlansky wrote in “Cod: A Biography of the Fish That Changed the World.” “The Boston Town Hall … had a gilded cod hanging from the ceiling [and]…after the American Revolution a carved wooden cod was hung in the Old State House” as if overseeing the commonwealth’s proceedings. If anything, fishing had an even greater impact on Maine, where cod remained plentiful close to shore right into the 20th century. Using logbooks, a University of New Hampshire team led by maritime historian Karen Alexander reconstructed the 1861 catch of the small sailboat fleet operating out of a handful of hamlets between Blue Hill and Winter Harbor. Using baited hooks and hand-held lines, these day fishermen caught nearly 10,000 metric tons of cod – more than the entire modern U.S. fleet in the Gulf of Maine was able to land between 1996 and 1999 with their powerful engines, enormous bottom-trawling nets and high-tech fish finders. The researchers estimated the overall 1861 catch in the U.S. part of the gulf at 78,600 metric tons. 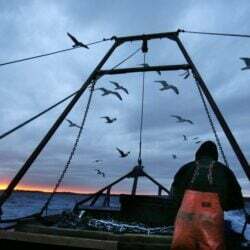 This year’s fishing quota is just 386 metric tons, because so few cod remain, the result of overfishing in the late 20th century and the failure of the stock to fully rebound – due, it is thought, to the temperature changes. “The warm water is absolutely not making things easy for the cod,” Pershing says. ecause it has been regularly fed by frigid currents originating in the Arctic, the gulf is home to a range of northern and subarctic species that could not thrive south of Cape Cod, where the warm Gulf Stream holds sway: cod, salmon, herring, mackerel, lobsters and a protein-packed, rice-sized copepod called Calanus finmarchicus on which many other species rely. The cold kept pathogens away, and was too hardy for annoying creatures like green crabs and jellyfish to take hold. This is likely due to the melting of the Greenland ice sheet and ice from the Arctic Ocean over the past two decades, which has dumped huge quantities of very cold freshwater into the Labrador Sea, changing the arrangement of ocean currents. 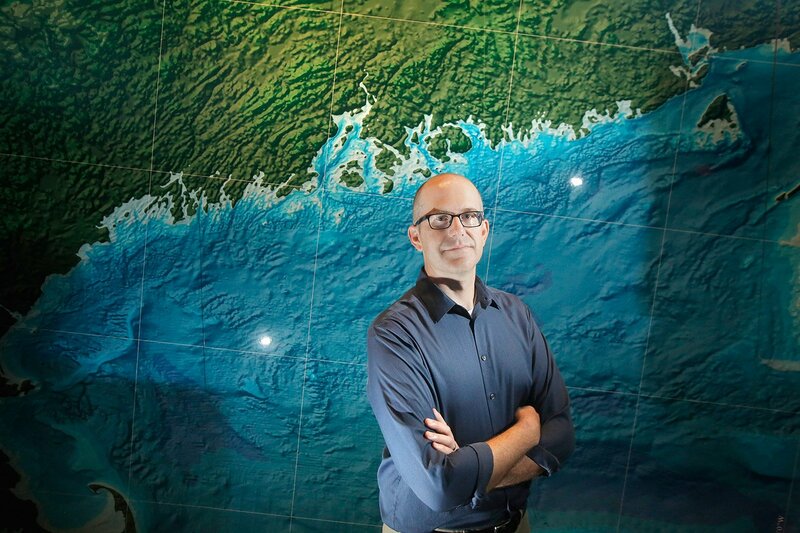 David Townsend, a biological oceanographer at the University of Maine who studies the phenomenon, says the localized effect has been the shifting of the extremely cold Labrador Slope Current away from the Gulf of Maine, resulting in greater deep-water inflows of warmer water coming up from the Gulf Stream to the south. 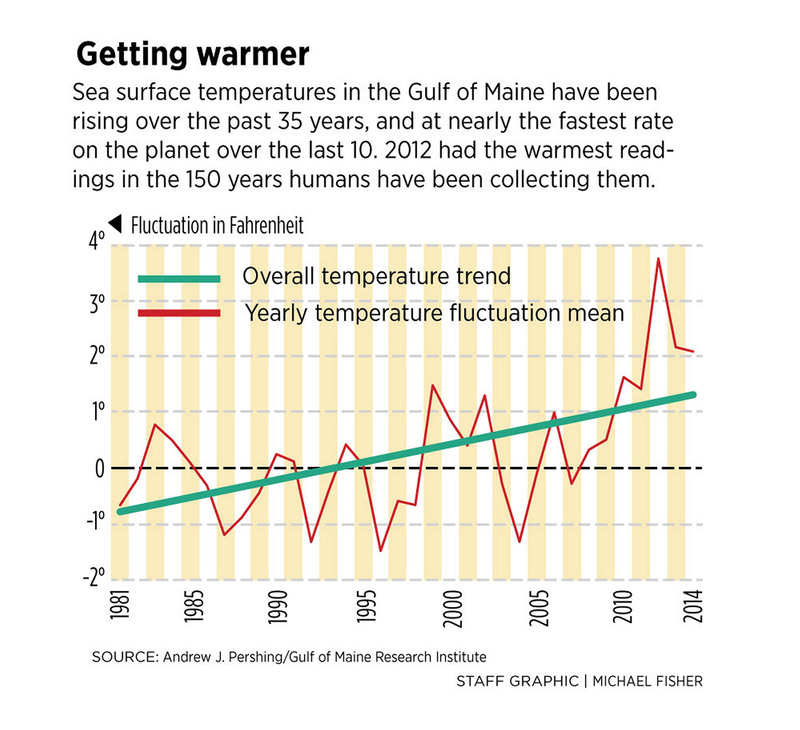 Temperature variability has always been a characteristic of the Gulf of Maine, which has always seen three or five years of warmer temperatures followed by a similar period of cooler ones. We’re still seeing that today, Townsend notes, based on pulses of cold water that still come down the coast of Nova Scotia and inhibit deeper continental slope water from entering our region. The difference in recent years is that when the Scotia current lulls, the slope water that pours in is far warmer than it once was. 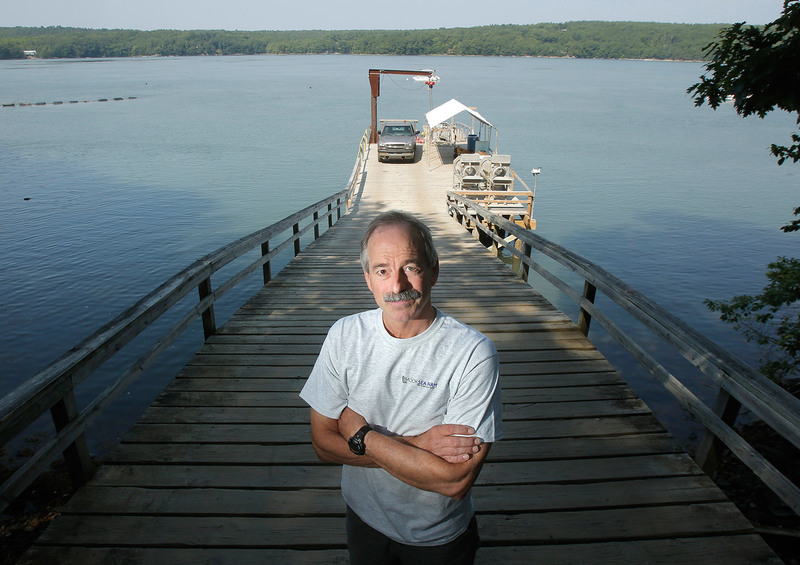 “For reasons that we do not understand, there is less Labrador Slope water sitting outside the entrance to the Northeast Channel than there used to be,” he says, helping drive the past decade’s temperature spike in the Gulf of Maine. What happens next “upstream” from us in Canadian waters is anyone’s guess. Annual reports on the state of the Atlantic Canadian marine ecosystem produced by Canada’s Department of Fisheries and Oceans indicate above-normal surface- and bottom-water temperatures for several years running and record-breaking levels in some areas in 2012, including the eastern half of the Gulf of Maine. 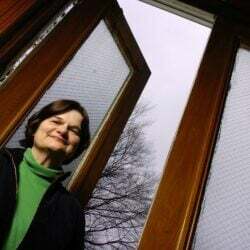 Catherine Johnson of the Bedford Institute of Oceanography in Halifax said the reasons for the warming of the deep-water were not entirely clear, nor was it well understood how these effects would work their way down the shelf. 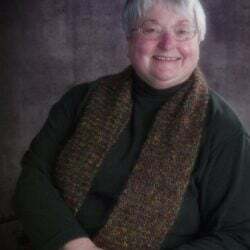 A half-dozen other Canadian government scientists who worked on the marine ecosystem assessment and other research relevant to the warming of the Gulf of Maine either did not respond to interview requests or could not obtain permission to speak to a reporter about them, and obtaining permission to speak to Johnson about her work took two months. Under Prime Minister Stephen Harper, government scientists have been prevented from discussing climate change-related research with journalists – sometimes unable even to answer questions about their own scientific papers in the public domain – prompting protests across Canada and hampering efforts to integrate information across the Gulf of Maine. mid the 10-year warming trend, the 2012 “ocean heat wave” stood out. 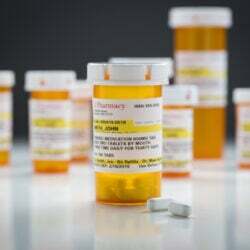 Researchers think they’ve figured out why that year was so unusual, providing some indications of how likely the conditions are to repeat themselves. As a result, the gulf never properly cooled down. In the first half of the year, water temperatures across the gulf and down to 150 feet or more were about 4 degrees Fahrenheit higher than they usually were; in some places there was an 8-degree spike. Things warmed further through the summer, sending shock waves throughout the ecosystem. Unfortunately, Gawarkiewicz says, the jet stream is still behaving strangely, getting stuck in place for long stretches of winter instead of undulating along over Maine, providing deep chills and brief thaws. The difference is that in the past three winters the jet stream has stalled with the northeastern United States stuck in the cold and the western United States in sustained warmth, whereas the opposite was true in 2011-2012. “Fundamentally the dynamics of the jet stream are changing, and we’re not sure why,” he says. Meanwhile, climate models predict atmospheric temperatures will continue to increase in New England in the coming decades, with average surface temperatures reaching 4 to 5 degrees Fahrenheit higher in 2050 then they are today, according to Massachusetts’ Climate Change Adaptation Advisory Committee. Average summer sea surface temperatures in the Gulf of Maine region will increase by about 5.5 degrees – a rate of just over 0.1 degree a year – between now and 2065, according to projections averaging the results of six independent models by a team led by John Loder, an ocean modeler at the Bedford Institute of Oceanography, a Canadian Department of Fisheries and Oceans research institute in Dartmouth, Nova Scotia. That’s less than the past decade’s unusually steep average rate (0.4 degrees Fahrenheit a year) but twice as fast as the 30-year warming trend in the gulf (0.054 per year). 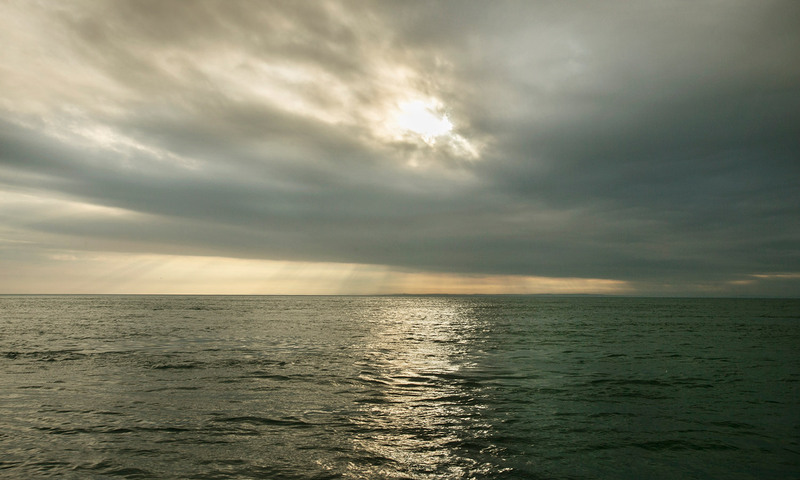 If the projections are accurate, sea temperatures comparable to 2012’s could be the “new normal” by 2050. Preliminary modeling by Canadian scientists of the ecosystem effects of a 1.8-degree Fahrenheit increase in average sea surface temperatures in our region over the next 50 years predicted a reduction in the total mass of all creatures currently living in the region of 19 to 29 percent. The biggest factors, says co-author Sylvie Guenette, a fisheries biologist in St. Andrews, New Brunswick, were a marked decline in phytoplankton and Calanus finmarchicus, which would trigger steep declines in cod, herring, lobster and other species. 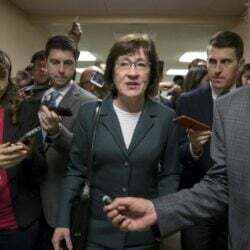 “This model is a first attempt, and there’s a lot of uncertainty in this,” she cautions, not least the fact that since it was created in 2009, predictions of how much the Gulf of Maine would heat up have more than tripled. While nobody knows for sure what all this will mean for marine life and the coastal economy, 2012 provided a sobering glimpse into a warmer future. 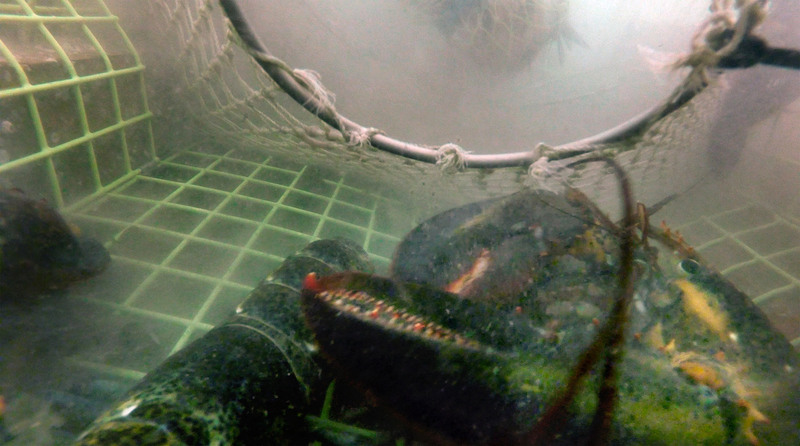 Maine lobstermen were pulling up mountains of soft-shell lobsters, but dealers had nowhere to send them. The Maritimes processing plants that usually purchase the lion’s share were still busy with the spring harvest from the Gulf of St. Lawrence. The price plummeted until it got so low the processors reconsidered, buying up the glut of cheap Maine lobsters instead of local lobsters, prompting eastern New Brunswick lobstermen to blockade trucks of Maine lobsters to prevent them from unloading. Police tactical teams responded to calls for help from lobster plants that had been surrounded by hundreds of angry lobstermen. On Eastern Egg Rock, puffin chicks starved because their parents were unable to find appropriate food for them, while off Grand Manan Island, northern right whales failed to find swarms of Calanus finmarchicus to eat. Cod, which fishermen had hoped were recovering from the overfishing of the late-20th century, were found to be in bad shape across the region, with very few young fish present in either the interior of the gulf or Georges Bank. Fishing quotas in the interior gulf were cut by 80 percent that year, and as bad news continued to roll in, the fishery was essentially closed in 2014, with federal regulators estimating the stock at less than 4 percent of the level deemed sustainable. hile 2012 was the warmest year on record, the ecosystem has been responding to the rapid warming of the past decade as well. William Balch of the Bigelow Laboratory for Ocean Sciences in East Boothbay has documented a reduction in the growth of phytoplankton, the microscopic plants at the base of the food chain. Each month in the growing season since 1998, Balch and his colleagues have surveyed the tiny plants from the Nova Star and its predecessor ferries as they cross the gulf from Yarmouth, Nova Scotia, to Portland. (When ferry service was interrupted, they used other vessels.) The readings were constant until 2007, when they saw phytoplankton concentrations fall by about three-quarters, where they’ve stayed ever since. Why? Balch thinks it’s because of increased precipitation, which has substantially increased river flows into the gulf. This water is laden with tea-colored dissolved organic matter that so happens to absorb sunlight in the same wavelengths craved by the phytoplankton, essentially cutting off their energy supply. The reduced flow of deep, cold Labrador water into the gulf – a key source of silicate, a nutrient needed by some types of phytoplankton – may have compounded the problem. 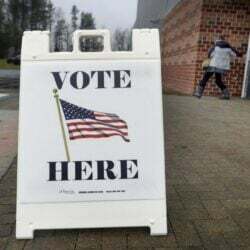 Maine and the region are poorly prepared for the challenges ahead, with critical scientific programs having been cut by Congress and the Canadian Parliament and climate change planning having been assigned a low priority under the administration of Maine Gov. Paul LePage. Monday: Rising temperatures may be causing a food shortage for native species from right whales to puffins. 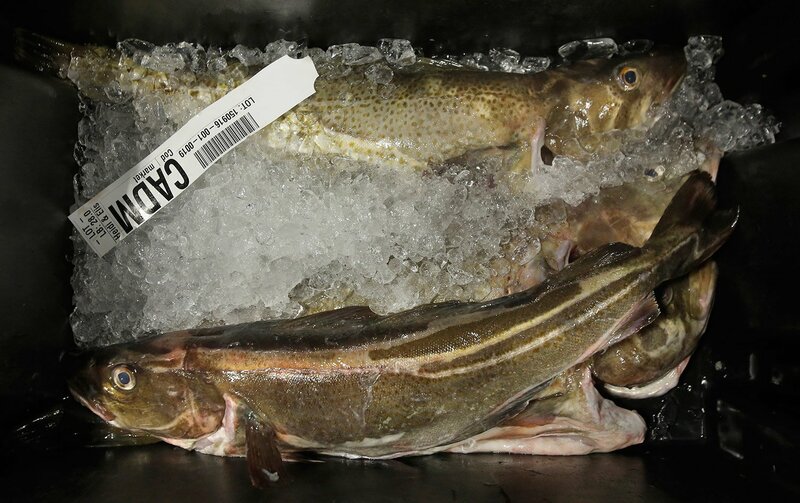 Tuesday: As the water gets too warm for comfort, fish like cod, flounder and pollock are retreating. Could lobsters be next? 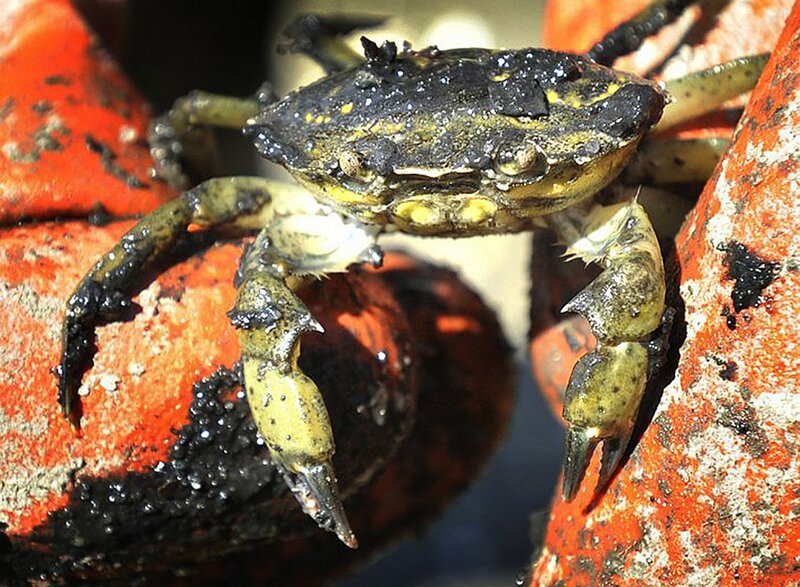 Wednesday: Invasive warm-water creatures are moving in, with sometimes destructive results.